The Process Optimization Device (P.O.D.) 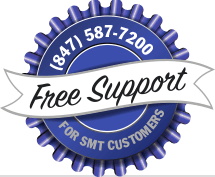 is SMT Research's independent, standalone machine that calibrates pick-and-place SMT lines using standard SMT parts. Sort statistical data in many different combinations using graphs, charts, or raw data. This allows you to effectively analyze equipment accuracy and isolate mechanical issues. Provides statistical results and machine offsets automatically. Manipulates data at the click of a mouse. Templates can be designed for any type of SMT Equipment to generate offsets for mechanical placement accuracy. 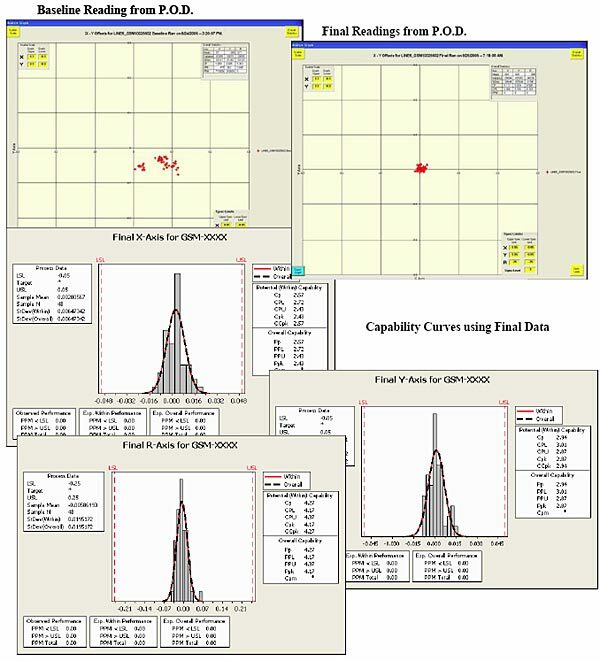 Produce real time SPC data and easily import data into any statistical software package. Use standard off-the-shelf components, including 0201's. 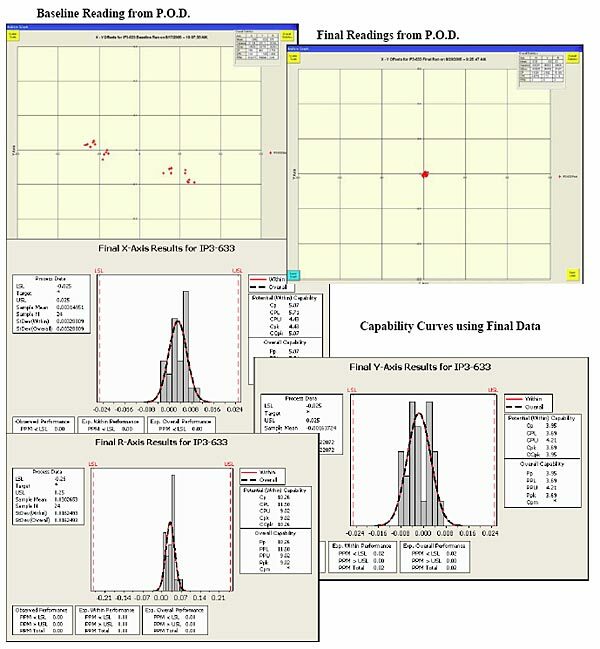 The following Measurement System Analysis (MSA) was conducted on the Process Optimization Device (P.O.D.) system used to measure the accuracy of production equipment. All results were calculated using Minitab version 14 statistical analysis software. Measurement system analysis is used to assure that the measuring system has adequate reproducibility and repeatability. The purpose of the study was to make sure that outputs from the P.O.D. were based on Process Variation and not Measurement Error. A gage R & R was then performed on the P.O.D. using chip parts. The application of Six Sigma requires that a measurement system analysis be performed to determine accuracy for capability measurements. Using Six Sigma standards a Gage R&R less than 10 is excellent, and the measurements can be used for process improvement. A Gage R&R from 10 to 30 is acceptable, but readings can only be used for process monitoring and not for process improvement. Gage R&R results above 30 cannot be used because the variation is too high. The Gage R&R results below are for each axis (X Y Q). Notice all results are well within the excellent range of less than 10. This means the P.O.D. introduces no statistically significant amount of variation to the readings, and can be used for process improvements. A complete MSA for the P.O.D. is available upon request. 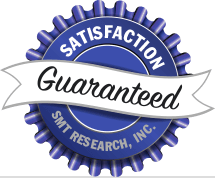 We at SMT Research firmly believe that you cannot inspect quality into a product. Defects are defects and no amount of inspection can change this. Quality has to be built in. Inspections will catch a percentage of defects. A higher percentage of defects passed into the inspection process will result in a greater amount of defects in your final product. The SMT process needs to be statistically sound and in control to produce a quality product. "You can not inspect quality into the product; it is already there." With the competitive environment facing our industry, the SMT machine replacement cycle has clearly slowed. Many companies want to keep their old equipment running as long as possible. The high cost of new equipment is often prohibitive. Inevitably high hour machines will exhibit signs of wear. Machine placement accuracy, overall speed, and performance will degrade. These issues are common to many circuit board assembly operations and can carry a high cost. We at SMT Research are devoted to helping our customers eliminate these costs. With P.O.D. technology we can rectify machine performance issues quickly and efficiently. Rarely do machines need a lot of expensive parts and costly repairs. Most often, all that is needed are mechanical adjustments and statistical calibration using our P.O.D. This brings the capability back to new OEM specifications. With the Process Optimization Device (P.O.D.) service from SMT Research Inc., vision assistance is used to measure components placed by your placement equipment. After inspection, the Service Engineer will then analyze the placements. Then either suggest repairs needed, or repair and mechanically adjust the machine on site. Once placement variance is reduced to within tolerance, the P.O.D. system will then update all placement offsets. This moves parts within the placement accuracy determined by the OEM or your own specifications. Statistically evaluate each machine's current placement accuracy and mechanical capability utilizing customers set specification limits. 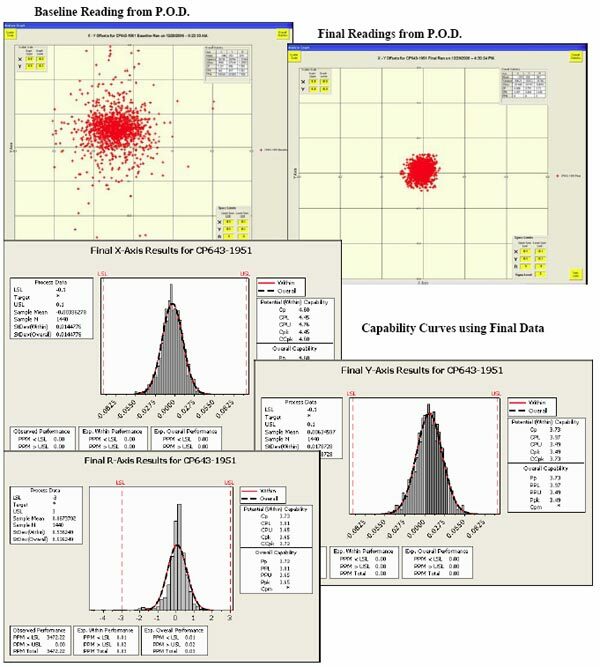 Evaluate and analyze process data to identify any machine deficiencies. Perform statistical calibration of machine's X, Y axis with respect to zero both with and with out optical correction. This will also detect worn X, Y table components. 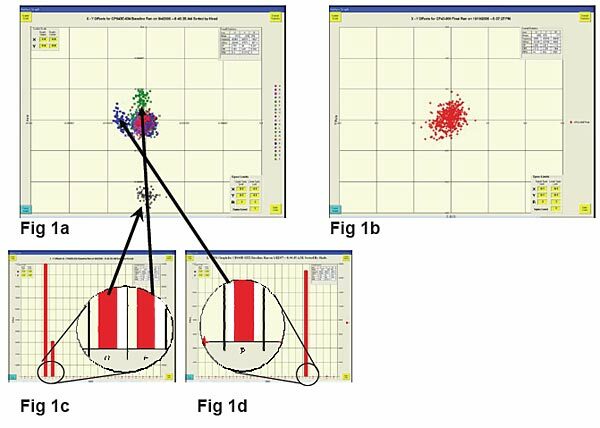 Perform statistical calibration of machine's nozzle shaft offsets for Place Position X and Place Position Y to increase machine capability and placement accuracy. 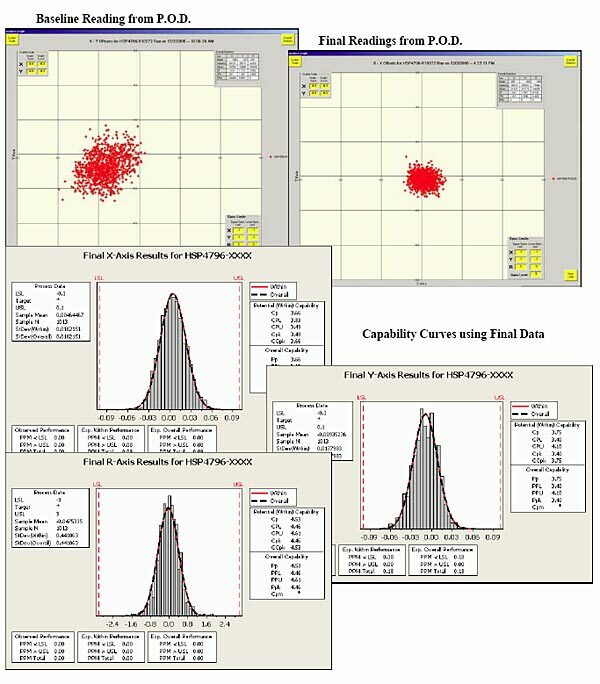 Provide each machine's placement accuracy (Cpk) via collected raw process data for customer to evaluate utilizing their own statistical software package and techniques. Submit to customer and review certified process data. In addition, repeat what steps should be taken in order to achieve and maintain an efficient production process. Address any other ongoing issues. Explanation of our nozzle holder and placement shaft rebuilding procedures. Explanation of feeder calibration using our fixture. If you have any specific needs to be addressed, please inform the service engineer upon his arrival so he can make time. Our P.O.D. process can be performed on any piece of equipment that is involved in the circuit board manufacturing process. This includes but is not limited to; chip shooters, fine pitch, screen printers, dispensers, and any other machine that puts item s on a circuit board. 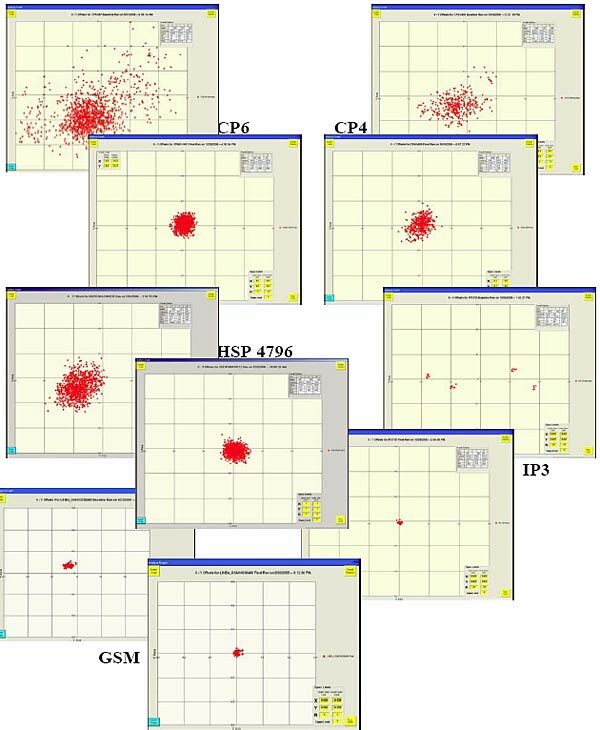 Below are some examples of different machines with before and after scatter charts. Once a board is read by the P.O.D., the data can then be analyzed in our P.O.D. software. This allows our engineers to analyze your machine to determine where any variance is occurring and correct the issue. The figure below shows data from a CP6 machine; it was determined that three shafts are out of specification. As you can see from fig. 1d, head "P" is out of specification in the X-direction and fig. 1c shows heads "D" and "E" are out in the Y-direction. Once this is known, the engineer can then determine if the problem is a mechanical or offset problem. In this case, mechanical variance was within specification and offset was determined to be the problem. Offsets were then generated and uploaded to the machine by the P.O.D. and a final board was run with results shown in fig. 1b. Below are results from a CP643 machine with multiple mechanical and offset problems. A baseline board was run, then inspected and analyzed with the P.O.D. system. Once the service engineer analyzed the board and repaired/adjusted the mechanical issues, offsets were then generated for the machine by the P.O.D. A final board was run to verify machine capability. Below are P.O.D. results for a FIP3 machine with offset problems. This machine was placing parts around the center target, but was off center depending on rotation. This caused parts to place off in the X direction by as much as 0.1mm or more, depending on which rotation the part was placed at. After a board was run, the machine offsets were updated by the P.O.D. and the final board readings are shown. Below are P.O.D. readings from a Universal GSM. A baseline board was run and it was determined that the machine needed centering with offsets. The offsets from the P.O.D. system were input into the GSM and final boards run. Results from a Universal HSP4796 are shown below. This machine had a combination of head problems and offset issues. Once the heads were repaired, offsets were calculated by the P.O.D. and input into the machine. The final results are shown. The production efficiency gained by using our service is considerable. Payback is usually measured in months, if not weeks. With the impending regulations for lead-free (pbFree) electronics manufacturers have either started lead-free lines or are in the planning stages. During this transition, process engineers will need to create a properly optimized and controlled lead-free process. There are many items in your process that will need to be altered or controlled to successfully move to lead-free. Many manufacturers have noticed a substantial decrease in the amount of "self alignment" that takes place during the reflow process with lead-free. With this change, engineers are now tightening placement specifications on their SMT process. With parts getting smaller and the movement to lead-free, placement accuracy is getting more critical and tolerances are getting smaller. To achieve these tighter tolerances, vision assistance is needed to calibrate your SMT equipment and reduce the amount of placement variance to an acceptable level. With the move toward "Lean Manufacturing" and the demands for higher utilization numbers from the equipment, accurate SMT placement is a must. Machines that have had the P.O.D. Service performed on them have the ability to run programs generated from CAD data with no "tweaking". This allows the ability to generate programs and start production with little intervention. Programs can also be transferred from line to line with no changes. With customers trying to get the most utilization from their lines, moving programs to other lines has become necessary. Of course, there are a multitude of other benefits to be found by having this kind of statistical data and analysis performed on your equipment.